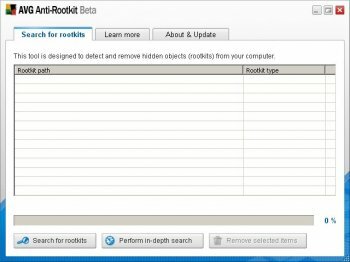 AVG Anti-Rootkit is a tool designed to detect and remove hidden objects, so called Rootkits, from your computer. It can even remove Trojans and Rootkits that are hiding inside NTFS Alternate Data Streams. This is absolutely amazing a free anti virus, but with this anti virus I've experience like I'm putting my unit in a great danger, when I've tried to install it absolutely you could see it deleting viruses amazing on the first try, I've tried to change my anti virus from avg to nod32 and I was so amazed that suddenly my nod32 was able to detect almost a hundred of viruses that are on my pc. The updates that it was showing on its interface was merely just a cover up with all its weaknesses, it's actually not making an update its detector remains the same as you update it, even you'll repeat it time to time or everyday no changes would be made, still it'll just remain the same as how you install it in the beginning. It works great! I've not experienced any problems with it. It's still a beta, thus it deserves some slack. Others have reported a Trojan in the download of previous versions, but I scanned the download with NOD32 and found nothing. I'd recommend that anyone concerned about rootkit infection also scan their systems with Sysinternals' RootkitRevealer and GMER, which is available for download on MajorGeeks.com. When I go to install this a box pops up saying that the installer is already running and than after I close this box another box from the most recent version of Comodo AV, and signatures, pops up saying that it has detected Trojan-Downloader.Win32.Agent.bcw in it. Anyone else get this sort of thing? 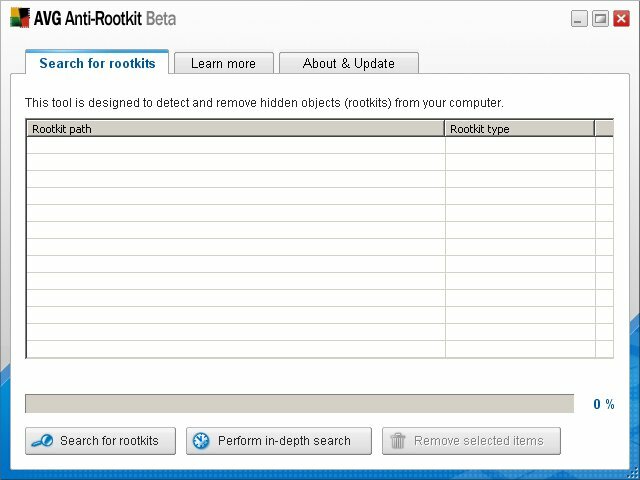 Really good tool, found a rotkit on my pc other tools did not find this. can recommend it. AVG Anti-Rootkit did not find "Microsoft Private Folder" on my computer. Well, this must be the latest, Freebie, from AVG. So, I put this program, on my computer, just to try it out, and, it showed, I had no Root Kit's, installed. What a relief! Nice, clean program. Very fast scan, but one odd thing. No, update file button, for new anti-root kit files. Could be, they will update this, on the next release.